In Ottawa, a group of dedicated students at Carleton University are raising funds and awareness in support of Canadian Feed The Children. The Carleton University CFTC Club is made up of approximately 20 university students who have made it their mission to fundraise in support of children, families and communities in Canada and around the world. The Carleton University CFTC Club was established in 2011 by a former student Christina Ou, who decided to create the club after volunteering in CFTC’s Toronto office. When Christina began volunteering at CFTC and learning about our work, she was surprised to learn about the needs of children right here in Canada and she was inspired to help. Although her education is taking her in the direction of a career in medicine, Christina is a natural fundraiser and started up the Carleton University CFTC Club to help make a difference for children in Canada and internationally. Since Christina graduated, a new leadership team has taken over and kept the CU CFTC Club thriving, recruiting more members to the club and raising awareness of the impact of hunger and poverty on children around the world. 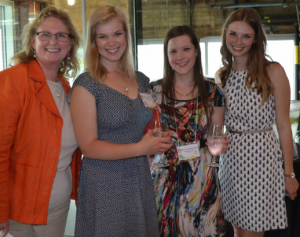 Kim Lawson, far right, with the CFTC team at a summer 2014 donor appreciation event. L to R: President & CEO, Debra Kerby; Amy Leblanc, Grant & Proposals Writer; Bonnie McKeown, Senior Community Engagement Officer, and Kim – volunteer and co-President of the Carleton University CFTC Club. The CU CFTC club is comprised of a variety of students from many different faculties including Political Science, Public Affairs and Policy Management, Child Studies, Neuroscience, Physics, and Business. They recruit members through friends and through events that engage with the student body, however most of their new members join in September as club members participate in the annual clubs’ fair during frosh week. Although they are one of the smaller clubs on the Carleton campus, these students are committed to the club and meet once a month to organize and plan their activities and fundraisers. Along with Henry Sum who took over as club president last year, Kim Lawson is the most recent Carleton student to act in the role of CU-CFTC’s co-president. An international development student herself, she also volunteered with CFTC in our head office in Toronto, where she gained an in-depth look at our programs. She returned to Carleton this year more committed than ever to make a difference in children’s lives. “I choose to become involved in the club because I felt that there was genuine interest on campus to learn more about international development and the work of NGOs. CFTC has strong sustainable programs which create infrastructure and development locally which I think many people find inspiring. With my knowledge from working at the CFTC office in Toronto, I have helped to create a stronger base of knowledge within our club about the importance of sustainable development and the work of CFTC,” said Kim. 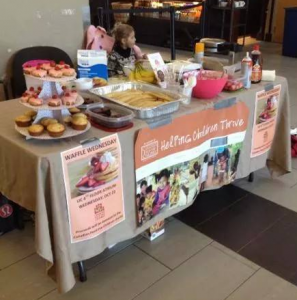 1) A bake sale: Several bake sale events have been hosted by the CU-CFTC Club over the past years. Just this past October, club members held a waffle Wednesday where they sold freshly made waffles and homemade crepes along with muffins and cupcakes to Carleton students. The yummy treats were made by club members and this one-day event raised approximately $200. 2) Evening yoga classes: A local yoga instructor (Anna Rafikova) generously donated her time and talent to lead one-hour yoga sessions for Carleton students on Monday nights for a semester. The club organized and hosted this weekly event, charging participants $8 per class with all proceeds going towards CFTC’s work to end child poverty. 3) A dodgeball tournament: Club members decided to start off the new year on a healthy note by hosting a dodgeball tournament on a Saturday in January. They set up a table in residence commons the week prior to the tournament and recruited teams to sign up. Seven teams of 10 people each competed in the tournament and they raised $420 from the afternoon of fun. Most recently, the club held a Valentine’s fundraiser where they sold roses to their fellow students with all proceeds being donated to support CFTC’s work. This Valentine’s fundraiser has become an annual event for the CU-CFTC club and this year they raised $300! Club members are already in the planning stages for their next event – and they want it to be big! Aiming to increase the funds raised for CFTC in 2015, the students are working on incorporating larger events into their fundraising plans and hoping to hold a tower climb challenge on campus later this school year. Inspired by the CN tower climb events which happen every year in support of several different charities, this group of highly motivated club members are sure to make “The Dunton Tower Climb” a big success. Canadian Feed The Children is extremely proud to be represented by the students of Carleton University. In addition to the CFTC club at Carleton we are grateful to have students across Canada raising donations and awareness on our behalf at the University of Alberta, University of Toronto, McMaster University and the University of Western Ontario. Kim added: “I hope to take this experience and all that I have learned both at CFTC head office and running the club with me in the future as I pursue a career in international development, hopefully leading to the United Nations!” With that kind of leadership and vision, we have no doubt that the Carleton University CFTC Club will continue to make a big difference in the lives of children around the world. Thank you to the members of the Carleton University CFTC club and everyone else who is helping CFTC to change the world! If you are interested in FUNdraising or wish to start your own club or group in support of CFTC, we can help you execute your vision! Call Bonnie McKeown at 800-387-1221 ext 234 or email: [email protected] and she’ll help you get started!